Today a coyote youngster was in an open area. 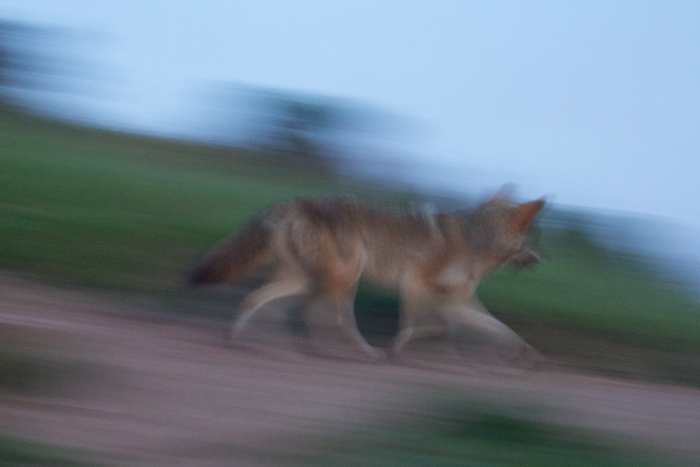 This coyote can be characterized as “careful and and dependent”. She’s wary and not willing to take chances, unlike her siblings. Today she had planted herself in a safe location near some bushes — she could escape to the bushes if necessary from any harm. From here she watched her surroundings, and she waited. She seemed to be waiting for a family member — someone familiar — to appear on the scene. Soon a sibling did appear on a hilltop, a sibling who has a dramatically different personality type from the one just described. I’ve observed their different personality types right from the start, nothing has changed from day one: just like humans, there is a lot which is innate and unique about each coyote. This one, in contrast to the previous one, could be characterized as “adventuresome and independent”. The adventurer saw her sibling in the field below and ran down to greet her, happily, caringly, affectionately, and the shy coyote ran to greet her: there was joy and camaraderie. Both coyotes then wandered around for a short time, and then the adventuresome one headed off to forage, hunt and explore the area beyond view. She was more interested in her explorations than in the other coyote, whereas the shyer coyote kept her eye on the more adventuresome one until she was out of sight. When the shy one sees the adventuresome one (left), she runs to be with her (middle), but I’m in the way, so she turns back to her safety spot and remains there (right). 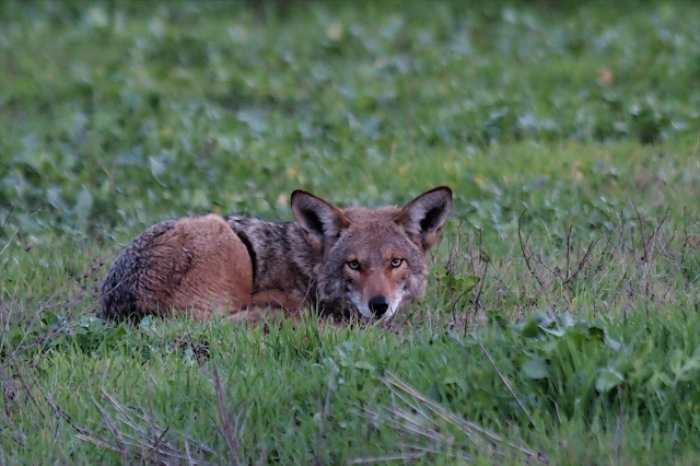 The shy coyote lay down to watch and wait again once her more adventuresome sibling was out of view. 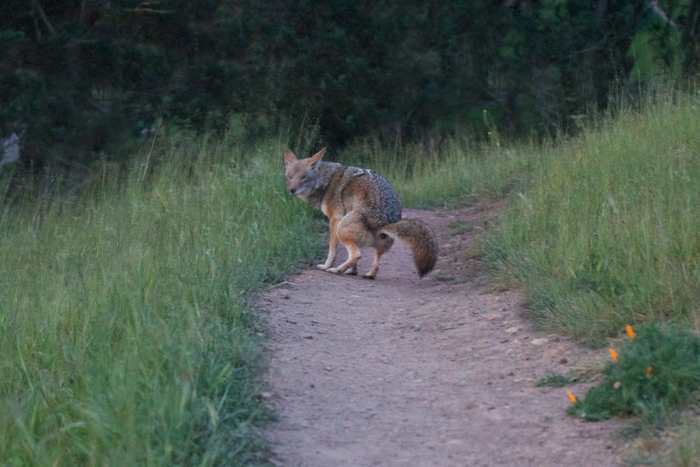 The adventuresome coyote seems to serve as a protector and role model for this shy one. When the adventurer eventually re-appeared in the distance, the shy coyote jumped up and ran full speed to be with her. 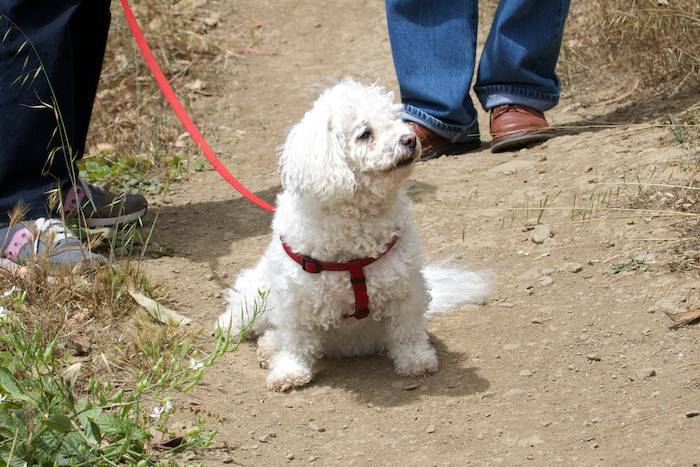 But the adventurer had not been aware that the timid coyote was running towards her. The adventurer turned back and away again as the timid one struggled to catch up. That’s when she saw she had come too close to me and would have to pass me to get to where she was going. She stopped. Apparently it was not worth the risk for her to follow her sibling. Instead she returned to her protected area where she waited again for awhile and then turned in for the day. Meanwhile, the adventurer spent the entire morning not too far away, discovering new places to dig up gophers, and spreading her wings a little bit more.